"Appears to work flawlessly, and relatively easy to use all features without instructions." "Love the device but the manual was lacking; however, the company made up for it phenomenally. I called them with my questions and they walked me through everything I needed to know and were just amazing. Never encountered such great customer service!" "The A++ grade says it all. We are extremely impressed with these products." "I love the red and black design of the Impulse but the Ecotester is my favorite. I've changed practically my entire diet and I haven't felt this well in years. It really makes you think about what you consume and put into your body and how unhealthy food makes you feel. Its incredible what a healthy diet can do!!!" "My soeks nitrate tester has become my most treasured kitchen tool. LOVE IT!!!" "I can't be more happy with my nitrate tester. Well, maybe if it came with a carrying case. Other than that, it's perfect!" "This customer gives it FIVE STARS. Top of the line device." "I just read a bunch of positive reviews on the ecotester and I am another satisfied customer. Definitely a MUST-HAVE." "It's a very good product, and works as intended. It would be nice thought if the sound could be set even louder, and for there to be an option to save the historic data to a computer." "Great, superb, phenomenal device! Extremely sensitive to ionizing sources, this handy device is consistent and reliable"
"Had to give the 01M Gen2 5 stars but wish I could give it 6 STARS"
"Would be better if came with a sample to test Geiger counter. Got a sample and worked great. Luckily no background radiation also. Easy to use." "I carry it on me around all the time, good unit, very sensitive"
"I work with old watches that may be potentially radioactive. The Defender suited the purpose perfectly." 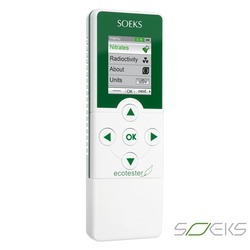 "SOEKS lives up to their reputation as being one of the most trusted names in radiation detection equipment"
"Easy to use! Accurate. Thank you!" "Great product, excellent value, I am very satified!" 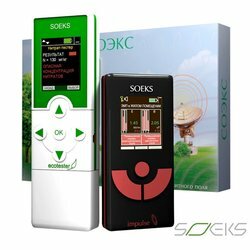 "Best geiger counter for the price"